BURNABY, B.C. - British Columbia's political leaders clashed in a debate on electoral reform on Thursday, with Premier John Horgan casting proportional representation as modern and even “hip,” while Opposition Leader Andrew Wilkinson insisted the system was too confusing. 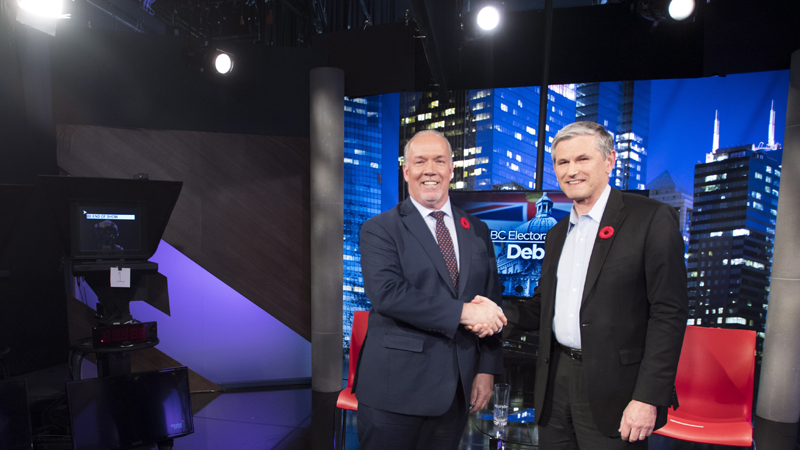 The politicians often talked over one another during the heated televised discussion on the province's voting referendum, with Horgan pushing a switch to proportional representation and Wilkinson defending the current first-past-the-post process. “Let's get modern. Let's get hip,” Horgan said. Wilkinson pushed back against Horgan's suggestion that the current system only works for the BC Liberals, which won the 2001 election and the next three elections. “Let's talk about how parliamentary systems have worked robustly across Canada and the English-speaking world for hundreds of years,” Wilkinson said. Wilkinson said he was concerned that Horgan's government had selected three options for proportional representation, two of which have never been used before, out of more than a dozen possibilities. The Opposition leader said a citizens' assembly should have been formed to create the ballot question. The three options on the ballot are somewhat complicated, but all would mean that voters still choose at least one local MLA while the legislature's make-up more accurately reflects the popular vote. The referendum is B.C. 's third such question on electoral reform, with previous votes in 2005 and 2009 that both ended in defeat. Horgan has said that he believes the third vote will be the province's last.